The eBook is in Adobe PDF format (which you can view with Adobe’s free reader). To celebrate the spring season, I’ve also decided to permanently reduce the price of my complete guide to wildflower photography. You can get the ebook now for just $12.00! Just downloaded it. Many thanks! Thank you so much, as a beginner in photography I apprecaite any information I can gather and learn from. Concise and very helpful. I coach a 4-H Photography group and this is exactly the type of materials the kids need in order to greatly improve their skills. Fantastic of you guys to release this for free. Much appreciated. Thank you for this wonderful helpful download. I shall get good use out of it this weekend if the rain stays away long enough. Thank you again. 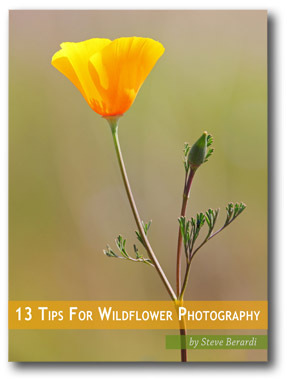 I can’t seem to download the free ebook on Wildflower photography, I’ve tried everything. @Carole – I apologize for the difficulty you’re experiencing. Did you try right clicking on the “download now” button and do a “save target as…” or “save link as…”? That usually solves most download problems. Thank you so much, I saved target as, it came right up. These ebooks are so great, I didn’t want to miss any of them. Thanks Steve. I’ve been looking forward to giving the spring flowers a go this year. This is the perfect advice I needed, just at the right time. Thanks for sharing excellent informations. Your web site is very cool. I’m impressed by the details that you¡¦ve on this blog. It reveals how nicely you understand this subject. Bookmarked this website page, will come back for more articles. You, my friend, ROCK! I found simply the information I already searched everywhere and simply couldn’t come across. What a perfect site. Thank you so much it’s very useful. Appreciate it.